Complete Review of Olark – Pricing, Features, Pros, Cons and More! 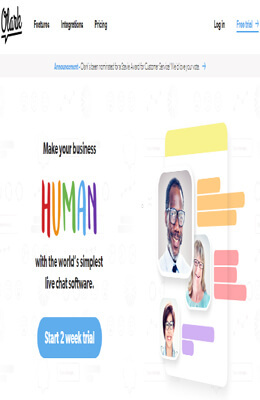 Olark is the easy to use Live Chat Software that allows you to offer a way to interact with your end user. You can instantly connect with your customer or visitors and start chatting with them. Olark is available for your business 24X7, no matter either your live chat agents are available or not. This tool is integrated with Groove, HubSpot, Salesforce, the Olark Slack App, Zendesk, Front, Help Scout, Desk, SugarCRM, Highrise, Nutshell, MailChimp, Microsft Dynamics, jira, Google Analytics, Shopify, BigCommerce, WordPress, ActiveDemand, GreenRope, Webhooks and more. It is very simple to customize Olark according to your website’s need, this will help you to look good during your entire flow of operations and make you confident while dealing with your end users.